Updated Monday April 9, 2018 by West Bend Little League. 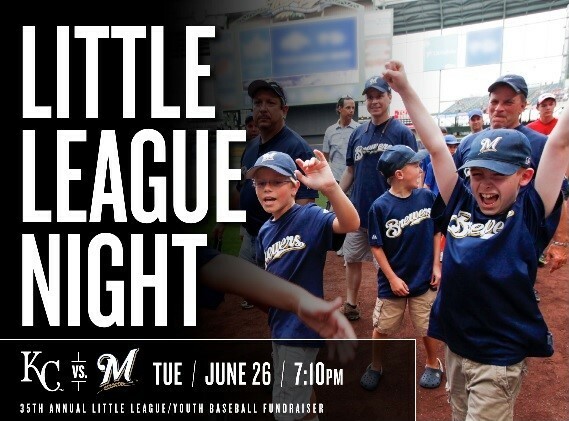 Gather your friends to come cheer on the Brew Crew at the 35th annual Little League Night at Miller Park as they take on the Kansas City Royals! Mark your calendars for Tuesday, June 26. First pitch is 7:10 pm. Note that no regular Little League games will be scheduled that night. This is a fun opportunity for camaraderie and team-building in a great atmosphere. Little League teams from all over Wisconsin converge on Miller Park with the kids in Little League uniforms parading into the stadium and around the warning track. Past outings have proven to be a big hit with the kids – and parents. It gets even better as the Brewers give the Little League organization a deal on the tickets. Prices are discounted from 16% to 32% off of their normal levels depending on which tier/section of the stadium you choose to sit in. The ordering deadline to shoot for is Monday, April 30th if you want to sit together. If you want to sit with specific families/friends, you should name a captain to consolidate orders and place as one. Note that they will obviously also all have to be in the same tier/level of the stadium. The final cut-off order date is 6/13/18. However, if placed after April 30th, you’ll likely be sitting away from the others in your group/team. See the attached PDF for more information and ordering details. Note that if paying by credit card, you need to also include the CVV number normally found on the back of the card. More information will be forthcoming regarding when and where the kids should meet, where to pick them up after they’re done parading, etc. Right now the Brewers are telling us to be lined up on the right field plaza and pedestrian bridge (depending where our assigned location is) by 6:00 pm that evening. Please email any questions to wbllbrewertix@att.net or call 262 306-9664.